Be the first to share your favorite memory, photo or story of Tanin. This memorial page is dedicated for family, friends and future generations to celebrate the life of their loved one. 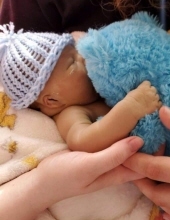 Tanin Rice Puls, the son Corey Puls and Cassandra Mueller of Grinnell, was born on Saturday, March 24, 2019 at Grinnell Regional Medical Center and died on Sunday, March 31, 2019 at Blank Children’s Hospital in Des Moines, Iowa as a result of Trisomy 13 Syndrome. A visitation will be held Saturday, April 13, 2019 at Smith Funeral Home in Grinnell from 10:30 a.m. to 11:30 a.m.
A celebration of life will be held at 11:30 a.m. on Saturday, April 13, 2019 at the Smith Funeral Home in Grinnell. Memorials may be designated to the Tanin Puls Memorial Fund. They can be mailed in care of the Smith Funeral Home, PO Box 368, Grinnell, Iowa 50112. Tanin’s time with his family was brief but filled with love. They had seven wonderful days with him. Inside his mama’s belly, he delighted his parents with his squirms and kicks. Tanin died peacefully in his parents arms and they are heartbroken they will not have the opportunity to see him grow. His parents knew his challenges were serious after he was born, and was cared for with lots of love and compassion by the doctors, nurses and staff of the Blank Children’s Hospital. Tanin is survived by his parents, Corey Puls and Cassandra Mueller of Grinnell; paternal grandmother, Lisa Pinkerton of Grinnell; Paternal grandfather, Troy Puls of Grinnell; maternal grandparents, Carol Mueller and Chris Mueller of Ricketts, Iowa; Tanin was preceded in death by his grandfather, Randy Pinkerton. To send flowers or a remembrance gift to the family of Tanin Rice Puls, please visit our Tribute Store. Or, if you would like to donate to the family, please visit Tanin's Tribute Fund. Help ease the financial burden placed on the Puls Family after the loss of a loved one by making a donation. "Email Address" would like to share the life celebration of Tanin Rice Puls. Click on the "link" to go to share a favorite memory or leave a condolence message for the family. Provide comfort by sending fresh flowers from our local florist or donating to Tanin's Tribute Fund.